A new report published by the Bulletin of the American Meteorological Society investigates the causes of extreme weather and climate events that occurred around the world in 2013. The report, "Explaining Extreme Events of 2013 from a Climate Perspective," integrates findings from 20 different research groups to assess the respective roles of human-caused climate change and natural climate variability in 16 extreme events. The attribution of individual extreme events to human or natural influence is a challenging and evolving field of science, but this approach—considering results from different research groups—enables increased confidence when multiple groups come to similar conclusions independently. For example, five of the research groups studied the record heat that occurred in Australia in 2013, and all five found that human-caused climate change increased the likelihood and severity of such an event. Heat waves in Europe and Asia were also found to be more likely as a result of human influences on climate. But for other 2013 events like droughts, heavy rains, and storms, the influence of human-caused climate change relative to natural factors was more mixed. For instance, the report did not find conclusive evidence for the impact of human-caused climate change on the ongoing drought in California. It did, however, find that human activity increased the likelihood of unusual atmospheric pressure patterns associated with the drought. Hence, although the attribution of the drought remains uncertain, a connection to human-caused climate change cannot be ruled out yet. In another example, the report found that while human-caused warming increased the moisture content of the air over Colorado, it did not increase the likelihood of the extreme rainfall that caused widespread flooding in Boulder last September (curious about this apparent contradiction? Learn more). In fact, human-caused climate change apparently decreased the likelihood of such an event—though the report notes that further research using additional models is needed. One reason that attribution of extreme events is difficult is that they occur infrequently, which makes trends hard to discern. For floods, observational records are also strongly influenced by human actions to reduce flood risk, which can mask underlying trends. Although regional trends in both floods and droughts have been observed, no nationwide trends are evident for these events. 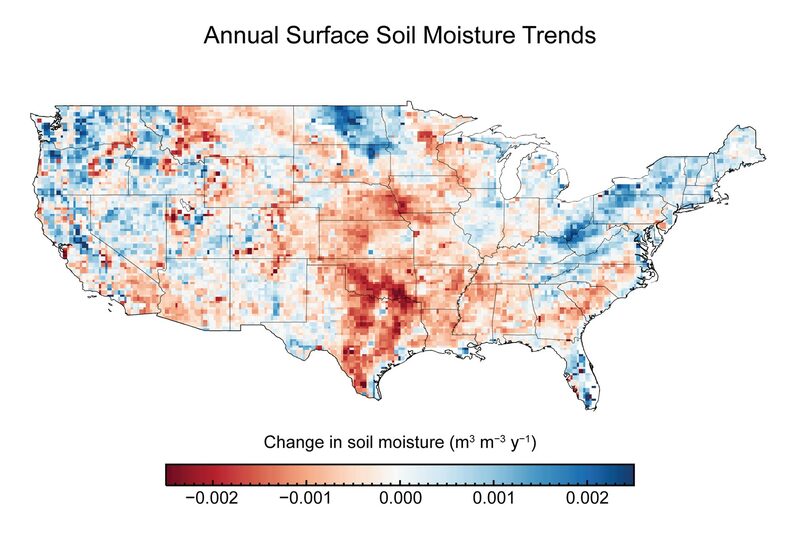 But there are trends in the factors that lead to them: for example, heavy rains that can cause flooding are increasing nationwide, and factors that lead to drought—increased temperature, reduced snowpack, reduced soil moisture, and others—are trending in a direction that favors more drought events in some regions. While attribution of individual events remains a challenge, droughts in the Southwest and heat waves in all U.S. regions are projected to become more severe as human-caused climate change progresses. Understanding the relative influence of human and natural factors in extreme events can help governments and communities make informed decisions about mitigation and adaptation approaches. In particular, being able to anticipate increases in specific types of extreme weather within a given region can motivate expenditures to reduce risk. NOAA scientists served as three of the four lead editors on the report, which has been produced annually since 2012. Report authors included scientists from NOAA, NASA, the U.S. Geological Survey, DOE’s Oak Ridge and Lawrence Berkeley National Laboratories, U.S. academic institutions, and research entities in other countries. "This annual report contributes to a growing field of science which helps communities, businesses, and nations alike understand the impacts of natural and human-caused climate change," said Thomas Karl, director of NOAA's National Climatic Data Center and Chair of the Subcommittee on Global Change Research (USGCRP’s steering body). "[T]he environmental intelligence the report yields to decision makers is invaluable, and the demand is ever-growing."